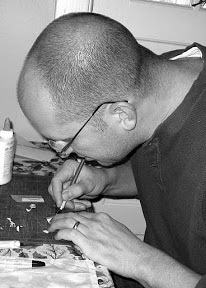 Old School Ron: Would you paint the border of your card? Would you paint the border of your card? You know, take an Unlimited card and turn it into a "Beta" with a little bit of black paint. It's a question that was posed on Facebook the other day by a member of the Old School Magic 4life Facebook Group. As can be expected, the replies are as varied as you can imagine. Everything from "hate it, wouldn't touch it with a ten foot pole" to "doesn't bother me in the least." I think the biggest thing with the discussion is the civility. Even with the wide range of opinions, the discussion has not taken a turn for the worse. I for one like that we're able to express our minds in Old School and have a place to discuss the merits of doing these kinds of things. But it brings up an interesting question beyond the obvious one of just painting your card borders. I think it goes deeper into the reasons we get into this game and why we play. Some of us collect the cards and appreciate the increasing value. We collect, buy and sell and enjoy the financial benefits that come with doing this. And some of us just like the pretty pictures and want to play "Magic." Me... I just like the pretty pictures. I've thought about coloring the borders of some of my cards. Every now and then I get the urge to do it, but I never follow through. Maybe I'm chicken. I have no problem altering an image though. I'll do that at the drop of a hat. Show me a killer alter and if I have that card in my deck, I'll have it done before you know it. But painting the border seems kinda strange to me. I don't know why, but it just seems odd. To be honest, there are some cards I think look better with white borders. Their colors are brighter and they just look better to me with a white border as opposed to a black border. For those specific cards, I'll go out of my way to get the white border version if possible instead of the Beta edition or black bordered one. Strange I know. I'm not against doing it (coloring a border that is). I'm not against buying a card that's had it done either if it came along with the right price tag. I don't mind alters at all and believe it or not, I prefer to have artist signatures on cards. It all comes down to customizing and how you want to express yourself through your deck. Some of us prefer the unblemished cards. Some of us prefer the wildly altered and scribbled on cards. The thing is... both play the same when you sit down across the table from your opponent. That's the beauty in all this. There's room for all of these variations in Old School. Find me another game where that exists. A reader on Facebook share this link:Ultra Pro inner sleeves with black edges. On Reddit, a reader shared their process for blacking out their card edges. 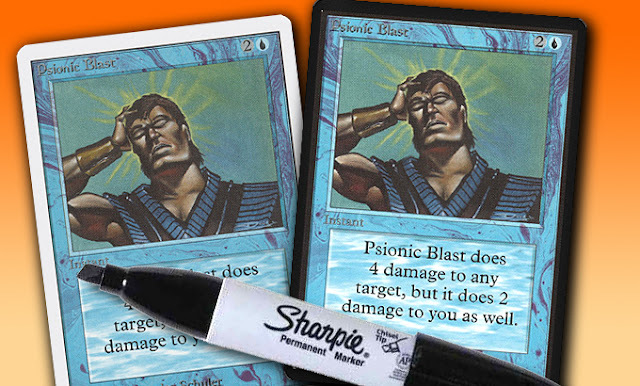 IMAGE: WotC, Psionic Blast Illustrated by Douglas Schuler.